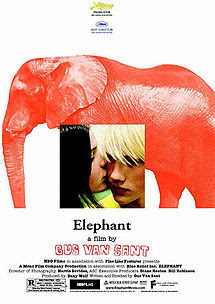 Four years after the Columbine High School shooting, Director Gus Van Sant tackled the issue of school shootings in his shocking and heartbreaking drama Elephant. It was awarded the Palme d’Or (Best Film) at the 2003 Cannes Film Festival. It also brought the Best Director award for Van Sant. Filmed in a documentary-like fashion and using all non-actors. The extreme realism makes it all the more effective. The camera roves and follows the students in long continuous takes. We get to know these kids as we sort of tag along on a seemingly ordinary day. Like every high school, there are cliques and loners, jocks and outcasts. They are all represented here but are not your average stereotypes. As with all school shootings, the main question is why? What drove these two kids to do this? There are never any easy answers and the film doesn’t pretend to know them. 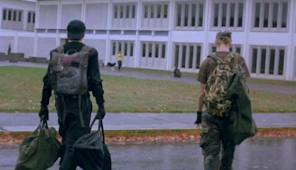 In the movie, Alex and Eric (the Columbine shooters were Dylan and Eric) are seemingly normal angst ridden teens. They play violent video games but also read and play piano. The parents are nowhere to be found and it is strongly hinted that the boys might be lovers. This could also be apart of their need for people in their life who understand them and won’t judge them. Part of the blame also falls on society itself as they are easily able to buy their high powered assault rifles over the internet. When the moment arrives to execute their plan they are cold and unremorseful. They roam the halls taking down anybody that gets in their way. After getting to know the victims throughout the majority of the movie it hits you like a ton of textbooks. There is no Hollywood ending, just a bunch of unanswered questions. It is the Elephant in the room at schools across America.